The de Blasio administration says it supports “broken windows” so long as it is done in a “respectful” manner. But that’s impossible. It is by definition disrespectful and oppressive. Last week, before medical examiners had ruled the death of 43-year-old Eric Garner a homicide as the result of a chokehold, pictures surfaced of NYPD apparently placing 27-year-old Rosan Miller in a similar hold. Miller is seven months pregnant and the police were arresting her for illegally grilling outside of her apartment in East New York. Today the de Blasio administration is defending the “broken windows” theory and practice, the idea of which says if you crack down on small/”quality of life” crimes then you prevent more serious crimes in the future. This, even after video surfaced of Garner being killed by NYPD because he was allegedly selling untaxed cigarettes. This, even after NYPD put a pregnant woman in a chokehold for grilling. This, even though all the evidence suggests that the “broken windows” theory doesn’t hold up. 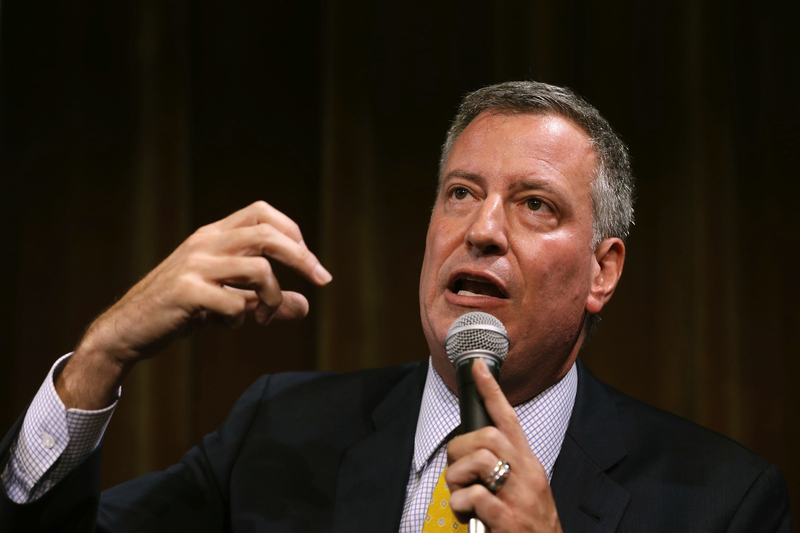 Mayor de Blasio is sticking to his guns. To say I’m disappointed would imply that I had expectations that things would be different. De Blasio showed his hand when he appointed Bill Bratton, the architect of “broken windows” in New York City, as police commissioner. Though he rode his anti-stop-and-frisk stance to victory, it never meant that de Blasio was going to usher in a new era of progressive community policing and nonviolent mediation of disputes. He just didn’t like this one tactic being used so much. The de Blasio administration says it supports “broken windows” so long as it is done in a “respectful” manner. But that’s impossible. It is by definition disrespectful and oppressive. As Jamelle Bouie lays out over at Slate, incidents like Garner’s and Miller’s are the inevitable result of “broken windows” policing. When you empower police to harass people for supposed crimes that harm no one, they will do just that. When property is deemed more worthy of protection than human beings, lives will be lost. And those who suffer the most will continue to be black, brown and poor, those who are already vulnerable. The police don’t have to have meetings where they determine they will go out into the streets and choke black people (and then tell us that what we saw wasn’t a chokehold). The “criminal element” has already been defined for them and the laws that afford them power have been written. All they have to do is show up. So long as the mayor, the commissioner, and other supporters of “broken windows” hold tight to the idea that they’re preventing crime through this tactic, more people will be harassed, choked, stomped, beaten and killed. But when the cost of doing business is black and brown bodies, even the so-called progressives appear to be willing to pay the price.